Eventful news came out yesterday regarding Oregon’s track and field team’s performance at the Don Kirby Elite in Albuquerque, N.M., the Millrose Games in New York and the Husky Classic in Seattle, WA. However, the outstanding aspect in those track meets was the school records that were snapped. First, sophomore Edward Cheserek broke the school record with a mile run time of 3:56.43 in the Wanamaker Mile competition. Although he didn’t finish at the top of the list, he did in fact receive a huge accolade that day. In addition, redshirt senior Daniel Winn ran the Husky Classic finishing fourth and also broke Mac Fleet’s previous record set in 2010 with a 3:57.62 time. This means that throughout the Ducks’ 2015 campaign to date, 14 Duck student-athletes have snapped the four-minute barrier indoors! Plus, all of these were achieved more quickly than when the previous records were set. During the NCAA Championships, Brittany Mann finished 7th place with a 17.07 shot put throw. Despite this major accomplishment on Saturday, a pair of redshirt seniors by the names of Erick Jenkins and Will Geogphegan finished first and second, respectively in the men’s 3,000. During the final laps of this specific competition, Jenkins was able to pass professional runner Andy Bayer and eventually, Geogphegan joined him to complete the race with a strong statement. The finish line times for Jenkins and Geogphegan were 7:44.91 and 7:45.71, respectively. Another school record that was broken on this day was redshirt sophomore Brittany Mann’s shot put toss of 16.93 meters, which means that she surpassed the school record by three feet. 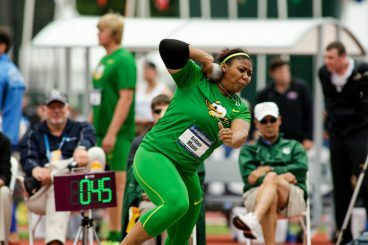 With this throw, Mann has placed herself in a qualifying position for the college championships and could ultimately be ranked seventh in the country with her dazzling and powerful tosses. Some notable, but not school-breaking-record, accomplishments on Saturday were redshirt sophomore Jasmine Todd’s and junior Jenna Prandini’s performances at the Don Kirby Elite. While Todd was able to match her personal best of 7.15, Prandini dazzled the crowd of spectators by reaching a new personal best of 7.17. In the Husky Classic, Alisha Rowlee, a redshirt sophomore, finished fourth in her competition, running 7.58. With even more achievements to acknowledge, Oregon had an eventful weekend day and will mostly likely carry this stellar performance to the MPSF Championships, which occur on February 27th and 28th in Seattle, W.A.